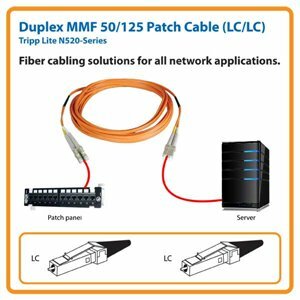 Tripp Lite's 35-meter ( 115ft ) multimode duplex Fibre Channel optic LC/LC patch cable is manufactured from 50/125 zipcord fiber. The cable has LC connectors on each end. It has a PVC jacket and is FDDI and OFNR rated. 50/125 Duplex multimode fiber is most commonly used in Fibre Channel applications. It is backward-compatible with 62.5 micron fiber and provides built-in headroom for future applications. The cable provides higher bandwidth optimized for Gigabit and 10Gbps networks as well. Also available in 1, 2, 3, 10, 15, 20, 25, 30, and 50 meter lengths. Enter "N520-" in the search field to bring up all lengths. For LC-SC cables, search "N516-", and for SC-SC, search "N506-". Don't settle for less than the best—enjoy better signal quality and faster transmission! Tripp Lite's N520-35M fiber cable assures peak performance throughout your local area network application. Unlike cut-price cables, the N520-Series is manufactured to exacting specifications, using superior materials, for a difference you can clearly see in your application. And we back our pledge of quality with a lifetime product warranty. This genuine Tripp Lite N520-35M fiber optic cable is the ideal solution for networks in need of fast, clear signal transmission up to the latest in industry standards. With attenuation loss that meets or exceeds current standards, fiber made from glass instead of polymer and documented insertion loss testing on every connector, Tripp Lite's fiber optic patch cables are ideal for high-density, demanding network applications. The N520-Series comes in lengths from one to 152 meters to fit a variety of installations. The N520-35M comes with widely compatible dual LC connectors that are thoroughly tested to ensure they meet Tripp Lite's stringent insertion loss standards. The connectors' edges are also beveled and color coded for easy and secure connection throughout your network. The N520-Series is optimized for gigabit and 10 Gbps networks and is also backward compatible with 62.5 micron fiber. The N520-35M is manufactured using top quality materials. With 50/125 duplex fiber, a FDDI and OFNR-rated PVC jacket, sturdy connectors and fiber made from glass instead of a polymer, Tripp Lite's fiber optic cables are made to last in high-demand data center and networking applications. The N520-Series is compliant with RoHS (Reduction of Hazardous Substances) standards, reflecting Tripp Lite's commitment to environmental responsibility. When you choose this genuine Tripp Lite cable, you get superior performance plus peace of mind! We're so confident of the quality of the N520-35M that we warrant it to be free from defects in material and workmanship—for life!